Over the last few years, more than driving diets and exercise regimes for my clients, I have changed my strategy and strongly drive a lifestyle change. A lifestyle change allows for solid benefits that are long lasting and develops a motivation that comes from deep within. Is fitness a lifestyle? Absolutely! Can it be fashionable? Yes! When we look at videos or pictures of our favourite Bollywood and Hollywood stars post a workout, or on their way to the gym, we observe the clothes they wear, the gear they carry and try to purchase the brands they favour. Take for example, Nike. Some of our favourite athletes embrace this brand and our choices for workout gear automatically takes after them. I have a client in New Jersey who purchased seven different coloured ‘drifits’ so that she could look forward to wearing a different colour every day of the week to the gym, and guess what? It worked. That was her motivation to get to the gym, feel good about what she was wearing and complete a one-hour workout. Imagine a gym where everyone wears a uniform. Boring! Colour and style stimulate the human mind, motivating you to do better when you see someone else fitting into a body defining top or low rise supplex pants. If you were to see your favourite athlete sport a new pair of cool shoes, you may want to get yourself a pair and if you do, I am sure that you would make an attempt to wear them and feel good. The ‘feel good’ factor is what being ‘fashionably fit’ should bring out, along with results that are good for your physical and mental health. There is also the other category of people who have the latest sportswear, bags, hydration sets and fancy gym memberships, whose primary goal is only to look good. That’s their priority and not ‘working out’. They are too conscious about how they look in their attire, or what other people think of them and the clothes they wear or the accessories they carry. Fashion should bring out the best and send out a message to people of all ages and regions across the world, that it is a fine balance of what you wear, how you wear it, and your attitude. 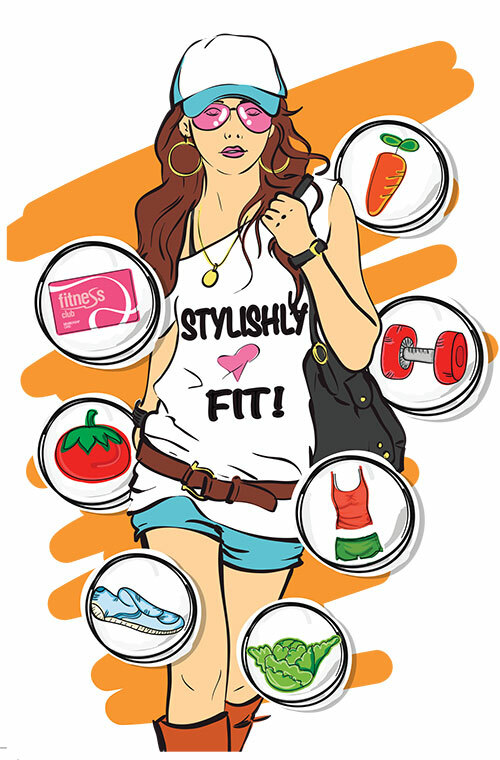 You need your health and a fit body to look and feel fashionable. Size-zero models across the world may look fabulous, gorgeous, mind blowing in the latest fashions, but do they feel that way? Most of them, I hear, feel sad, deprived and depressed because of what they have to do to maintain that size. What if I told you that you could wear the latest fashions, look good, feel good and also feel happy and comfortable in your mind? Follow these simple steps below…. It’s all about cellular health. Feed your cells with the right nutrition from fruits, vegetables, nuts, low fat dairy and lean meats and deprive them of refined flours, sugars, salty and packaged foods. Eat less. Even reducing your serving at each meal by one tablespoon will help you lose or maintain a healthy weight. Eat slowly and stop when full. Most fast eaters eat more than their body requires and any additional food that your body doesn’t need, will be stored as fat and will also lead to disease in the long run. Stay hydrated. Too many people confuse thirst for hunger. Drink pure water and lay off the colas and sodas. Lemon is a liver detoxifier and rich in Vitamin C. It boosts immunity, reduces fatigue and keeps your cells healthy. Since it keeps your liver clean, it also improves your body’s ability to break down fat. Start the day with water with freshly-squeezed lemon to jumpstart the metabolism and clean the liver. It may appear to be fashionable to have a cigarette in hand, but it will certainly reduce the number of fashionable and healthy years you live. Smoking will make your skin wrinkle and age rapidly, besides sucking nutrition out of cells, allowing for poor hair growth and the possible onset of diseases. Let dinner be your lightest meal. The human body does not need carbohydrates like roti/ rice at dinner time. You need nutritious foods rich in protein and healthy fats. A bowl of stir fry veggies with tofu or lean meats, or a bowl of cooked veggies with pulses, a three- bean salad or moong dal pancakes make for ideal light dinners that will keep the pounds off and your metabolism at its peak. Drink a large glass of water 10 minutes before every meal. Even just a 30-45 minute brisk walk six days out of seven will lead to fat loss and body toning. Choose an exercise you love and do it. What’s your motivation? Invest time to reflect on that. Do you want to be able to be active and fit and do all the things you are currently doing when you are older? Do you want to stay updated with the latest fashions and be a part of it? Do you want to live a life of happiness and health, with the least suffering? Well, you need your physical and mental health for all of that. Fad and crash diets only make you crash terribly in the long run. Never eat with guilt. If you eat a cupcake with guilt you will put on weight. It’s always mind over matter. Enjoy the cupcake, be grateful for it, eat it slowly and forget about it. It will not make you fat and in compensation make sure you work out, or reduce the portion size of your next meal. Stress will make you fat, so take it easy, breathe deep and remember, worrying is just a down payment on a problem you may never have. Don’t let peer or social obligations and pressures be the cause of you getting fat or sick. Sleep seven hours every night. Get your share of healthy omega 3 fatty acids from nuts, seeds or fish. Binge eating? Maintain a food journal. Nothing works better than writing in a food journal that makes you aware of a behaviour pattern. Food journals self motivate and help you get back on track. Practice gratitude. Nothing can be more important than this. Offer thanks and gratitude for what you have and get, your health, your relationships, career, wealth and you will get more. Complain and be ungrateful, and you will attract more negative things. Choose wisely. Make a lifestyle change. Go on a shopping spree and buy yourself a whole new wardrobe of the most fashionable sportswear and accessories but remember the larger goal is to treat your body with respect and to follow the laws of nature. Time waits for no one, so the change must start today.